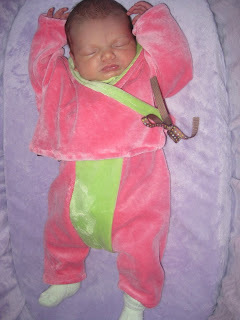 I cannot believe it's already been over a week since our sweet little girl was born. 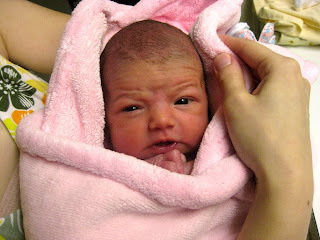 The days have just flown by in a haze as we've fallen in love with her & been adjusting to being a family of 5. This two-piece is a pattern from Ottobre Design which is super easy to make. I added some green fabric as trim to the top & a colorful grosgrain ribbon as the tie to make the design a little livelier. I used my fave bamboo/organic cotton velour fabric so it is uber-soft. 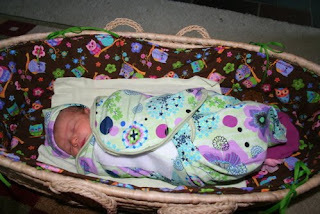 Here's my revamped Moses basket in action with Serena modeling my swaddler wrap & matching cap. I love making these wraps and they are practically an outfit themselves. I've had a really quick & easy recovery this time around & all 3 kids gave me a few hours breathing room today, so I got in a little sewing time with an old fave pattern & some great new fabric I bought just before baby's arrival. It feels so good to be back to my old self (just a bit shorter on sleep) & back in the sewing saddle. It really is my favorite way to relax. Looking forward to sharing my first post-natal creations! such a cutie, glad your recovery is going well! Can't wait to see what you have made!